Happy Wednesday! On Saturday I ran the Airbnb Brooklyn Half Marathon and I cannot wait to tell you all about it! Today I’m linking up with Annmarie from The Fit Foodie Mama, Angelena Marie from Angelena Marie: Happy, Healthy & Balanced, Michelle at Fruition Fitness and Nicole from Nicole from FitFul Focus for Wild Workout Wednesday! For my recap from 2015, click here. * It is the largest half marathon in the country. The morning of the race I was greeted by my alarm at 4:00 am. Let me tell you, this was painful! We needed to leave Connecticut by 5:00 am so I wanted to give myself enough time to eat and get ready. I had been dealing a weird stomach bug all week so I was a little nervous about how I would feel but I woke up feeling pretty good that morning (thankfully)! Also the weather could not have been better – low 60s, no rain, little wind and a little overcast. Luckily we didn’t hit too much traffic on the drive down to Brooklyn and we arrived with plenty of time to spare, around 6:15 am. I took this photo of Grand Army Plaza while we were waiting. The race had two different start times. Runners in Wave 1 would start at 7:00 am and runners in Wave 2 would start at 7:45 am. I was in Wave 2 so I had plenty of time to sit and try to stretch a little before having to get in my corral. On the way to the corrals, we passed security. It literally took all of 5 seconds – no lines and everything was super organized (hint, hint Rock ‘n’ Roll Brooklyn). We were told earlier in the week that our corrals would be closed by 7:20 am so my friend and I tried to enter around 7:00 am…..and it was complete chaos. For some reason the port-a-potty lines extended into the corrals. As you can imagine, this made the corrals super-duper crowded. In addition, no one really knew where to stand to get in line for the port-a-potties. It was very strange and I’m not sure why they did the set up that way. That’s one thing they could look into changing for next year. After chatting with some super nice people for about an hour, I finally crossed the start line around 8:15. I hot the start button on my watch and started my Brooklyn playlist and then it was time to get moving! Click here for a cool interactive map that outlines the course. This part of the course is mainly flat. There is a great out and back part near the Grand Army Plaza. It’s nice because you can give out some high fives and cheers to the runners on the other side of the out and back! I saw this awesome sign during the first mile that said ‘Punch Trump’ and there was a little inflatable head that people could punch. I wish I could have crossed over from the left side of the road to the right side so I could have punched it! This part of the race takes place in Prospect Park. A few inclines, but I would only say maybe one significant hill. Running in the park is great because you have shade from the trees and you also get cheers from other runners in the park that are not running the race. A nice downhill and then you’re out of the park and on your way to Ocean Parkway! This would be the best part of the course to pick up the pace if you want a PR because it’s nice and flat. That WAS my game plan for the race until my hips started really bothering me around mile 8. I had to stop every mile after that to stretch and I lost a lot of time. I was dissappointed but hey, sometimes those things just happen. I think this is the funniest part of the course. I saw so many awesome signs and little kids giving out high fives. It gave me a lot of energy when I was feeling down during those last few miles. You’re in the home stretch! You can see Coney Island in the distance and you can hear music playing. Keep running and then go up a small ramp until you hit the Boardwalk. Then run the last few meters to the finish line!! 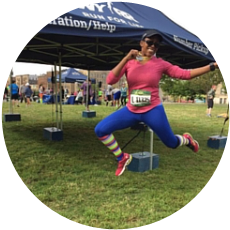 * FREE race photos! This was a total shock and I didn’t find out about it until after the race was over. This is such an awesome perk for a race of this size! * Hydration – There were water and Gatorade available every mile. I really appreciate this because I was able to re-fill my handheld multiple times. * Race Shirt – Great material and fit. * Medical Tents – Again, plenty of medical tents on the course. I felt good knowing that there were so many available. * Crowd Support – So many awesome spectators giving out high fives and holding really funny signs. I always appreciate a good laugh while I’m running! * Finisher Medals – As always, the medals are AMAZING! The ribbon was realy nice and had the name of the race and the date and the actual medal is pretty heavy duty! * Corrals – As I mentioned before, it was a little bit chaotic because of the port-a-potty situation. It just felt extremely crowded and not very organized. *Post-race food – While I appreciated having all the goodies in one bag, what was inside the bag could have been better. We got bottles of Gatorade and water, an apple, a small bag of pretzels and a Powerbar. The flavor for my Powerbar was absolutely disgusting (lemon poppy seed pound cake) and I cannot eat an apple without washing it off (I just worry about dirt and germs). I’m always surprised when half marathons don’t have bagels, or some other carb, at the finish line. …and now for some fun stuff! New York Road Runners posted some awesome videos from race. Check out this video of animals wearing the finisher medals, awesome children spectators and funny race signs. * If all the runners from the race stood hand in hand, it would be enough to line the Coney Island Boardwalk 11.5 times! * How many times could the average runner listen to “No Sleep Till Brooklyn” by the Beastie Boys while running the race? 30 times! * Running a half-marathon burns 1,700 calories, which is about 6 Coney Island hot dogs! * There were 18.409 first time runners of the race. * The race runs through eight neighborhoods. * You would need to ride the Brooklyn Cyclone 26 times to cover the distance of the race. What a big, fun race!! I live in a small town so my local races are totally different than that. Sounds like a blast though. Sorry about the cramps, but congrats on a great race. Thanks Julie! If you every come to New York, I would highly recommend this race! I had no idea that it was the largest half marathon in the country, that is crazy! Looks like a fun race- love that they have free race photos! Great job pushing through despite issues with your hips!!! The free races photos are new this year which I think is just amazing!! I think you would really enjoy this race! Looks like a fun race! My favourite part of the New York marathon was Brooklyn so I would love to run this one. Congrats on a great race. I’ve also heard that Brooklyn is the best borough during the NYC Marathon – I cannot wait to experience that! I”d love to do this race! It sounds like so much fun. I’ve never done a NYC race. I think I need to. Great recap! This does sound like a really fun race that I need to put on my radar for next year! I’ve never raced or run in Brooklyn so this sounds awesome. Congrats on your race, it sounds like you had a lot of fun! It’s definitely a fun race! It’s a little out of the way for me from a traveling perspective but it’s still worth it! The punch trump thing was so good!! I saw that guy twice on the course! I really liked that the portapotties were in the corrals, but agree the lines got crazy and confusing. I can’t wait to get my pictures, though! Congrats on your race! I only saw him once but I laughed so hard when I saw him! Part of me thinks the portapotties situation may have been worse for wave 2 vs wave 1! I hope you get some great photos! I don’t think I could do a race that big! I really don’t like races that feel impersonal… so many people just make it nervewracking for me. I totally understand where you are coming from. I’m odd in that I enjoy both the small hometown races and the larger scale races. Congratulations and great recap! I saw so many posts about this race on Instagram, so I guess it makes sense that it’s the largest half marathon in the country. In terms of the free race photos, I think more and more races are going that way, particularly since MarathonFoto prices are pretty high. Congratulations! Thank you so much! I totally agree that race photo should be free, especially with the ridiculous prices that MarathonFoto charges! Congratulations! I had no idea it was the largest half marathon in the country. Love that you get free photos!! Thank you! Aren’t the free photos awesome? I really enjoyed that perk from the race! You are going to love it Abby! I’m coming all the way from Kansas to run it in 2017. Thanks for the recap. No problem! It’s an awesome race and I think you will really like it!